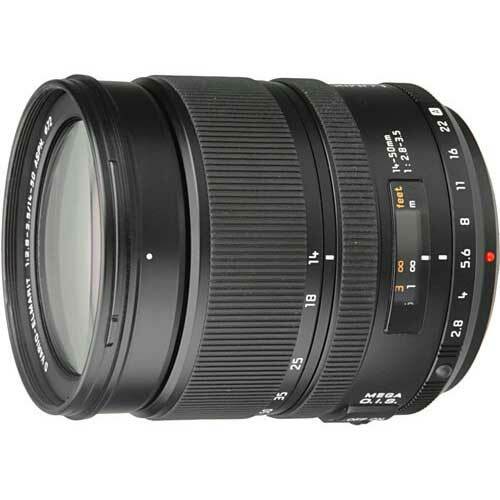 Lens Description: The Panasonic 14-50mm f/2.8-3.5 Leica D Vario-Elmarit Aspherical MEGA O.I.S. Lens is an interchangeable bright standard-zoom lens, developed by Leica exclusively for digital SLR cameras, and follows the Four Thirds Standard. This means that the lens is also interchangeable with other manufacturers that use this format. With a bright maximum aperture of f/2.8 and the incorporated MEGA O.I.S. (Optical Image Stabilizer), this lens makes it possible without using a tripod to capture clear, sharp images even in macro shooting or low-lit situations. This provides users with more shooting flexibility. In addition, the lens maximizes this advantage by incorporating Panasonic's Venus Engine PLUS LSI into the lens.